Professor Asai graduated from the Department of Physics at the University of Tokyo in 1990, then the School of Science Master’s Program in 1992 and the Ph.D. Science Program in 1995. In 2003 he became an associate professor at the University of Tokyo’s International Center for Elementary Particle Physics, and then an associate professor in the School of Science in 2007. He took up his current position in 2013. Professor Asai’s specialty is particle physics. The discovery of the Higgs boson was the establish of the Standard Model, a description of the components making up the natural world from the subatomic level, the smallest unit. It was also an event that the notable revolution or the paradigm shift in the particle physics. The “vessel” that encompasses this vacuum field from the outside is space-time. Professor Asai’s current interest lies in finding how space-time was created, and how it affects the vacuum field and particles. The search is likely to be a long one, possibly requiring decades or even centuries. The Asai Laboratory has the mood of a place that’s taking on such a great challenge, but at the same time it is an enjoyable atmosphere, permeated with a field of fun, like a Higgs field permeates a vacuum. “When you’re trying to answer big questions, the most important thing is never giving up. Keeping at it requires that it’s enjoyable, though, so fun is an important element. I try to give my students both freedom and responsibility, and to note the importance of accumulated small victories. I want them to have those flashes of understanding as something to treasure as their own.” Professor Asai and his students have numerous conversations as they assist each other in their daily research. Progress in science relies on researchers developing ideas that only they know. The Asai Laboratory is a place where students learn to uphold their freedom and responsibility while coming into contact with the cutting edge of research in particle physics. CERN’s LHC is an enormous particle accelerator; one lap around the tunnel is a 27 km trip. The photo shows the ATLAS detector inside the LHC. This device, named after the Titan of Greek mythology, weighs 7500 tons, is 44 m long, and 24 m tall and wide. 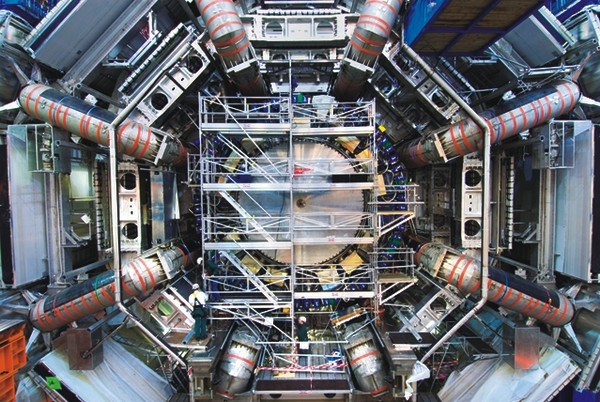 The detector sits at the proton–proton collision point, and is able to detect the type and movement path of particles spewing out from collisions with very high accuracy. Photo supplied by CERN.